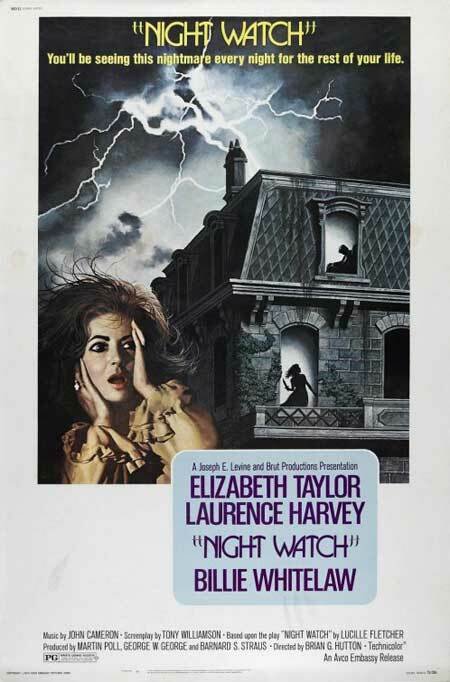 4-Word Review: Murder in the window. Ellen Wheeler (Elizabeth Taylor) is an emotionally unstable woman recovering from a nervous breakdown. Her first husband died in a car crash along with his young lady lover. Now her second husband John (Laurence Harvey) is fooling around with Ellen’s best friend Sara (Billie Whitelaw). One night Ellen witnesses a murder at the abandoned house next door, but because of Ellen’s past mental state no one believes her. Even the police doubt her story, which starts to send her over-the-edge. I saw this play about a year ago with a group of friends at a local church. 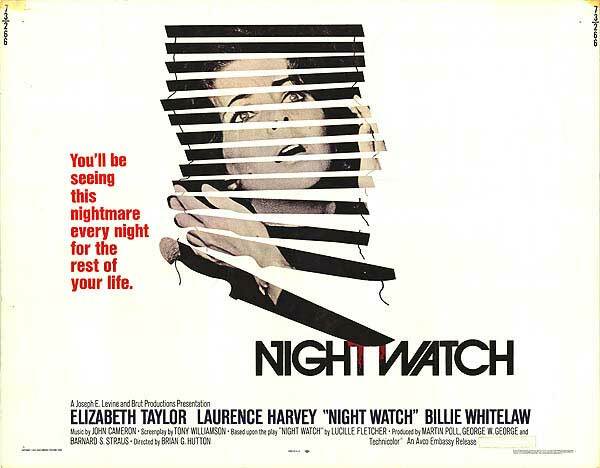 It was written by Lucille Fletcher best known for having done Sorry Wrong Number, which was later turned into a classic film starring Barbra Stanwyck. Although the play started out slowly the twist ending was impressive and something no one in the audience had predicted, but what I liked even better was that when you went back and thought about it, it made perfect sense. I thought at the time that it would make a great movie and was interested in seeing what this film did with it. I felt that there was no way they could screw up such a great story, but somehow they managed to do it. Director Brian G. Hutton adds a lot of elements to make it more cinematic that should have helped it, but it really doesn’t. I liked the flashback sequences showing the car crash of the first husband as well as Ellen visiting the hospital and identifying the bodies. These segments have a good nightmarish visual quality to them, but Hutton goes back to it too often and eventually wears it out. I also liked that the film shows the police inspecting the inside of the abandoned home, which in the play you never see, but I felt they could have done a lot more to make the place seem more distinct and creepy. There is also a skirmish between two people inside the place at the end that you can hear, but not see because it is too dark and shadowy, which was annoying. The music is effectively creepy, but it also has a ringing quality that quickly becomes irritating and gets way over-played. This was just one of the many misfires that Taylor did during the 70’s that helped extinguish her otherwise illustrious career long before it should’ve. This one fares slightly better than the others, but not by much. Her affected British accent could seem annoying to some and sounds kind of like the put-on one that Madonna sometimes does although for the record Taylor’s is better than hers. Liz’s emotionalism is a bit too theatrical and may come off as unintentionally funny to certain viewers although seeing her go completely nutty is impressive and fun. Harvey is all wrong as the husband. His cold, detached presence can work in certain roles, but definitely not in this one. In the play that I saw the actor cast in this part looked more middle-aged with a spare tire stomach, balding head, and graying sideburns, which is what I felt the role called for. This is a character that is overburdened with a stressful job and unstable wife and yet Harvey shows none of this. His slick black hair and turtleneck shirts, which were fashionable at the time, make him look like someone still going out to the trendy nightclubs to pick up young chicks… or guys. Whitelaw is one of the best British character actresses of all-time, but her talents are wasted with a part that doesn’t allow her to show any range. Her blonde hairdo is nice, but Taylor’s histrionics dominate the proceedings and unceremoniously push Whitelaw into the background. The play had a lot of humor especially with the Mr. Appleby character played here by actor Robert Lange. Unfortunately the movie turns it into a serious drama making it seem more like a soap opera instead of a mystery. I came away from this feeling that the live production that I had seen was far more entertaining and intriguing. I would suggest to viewers to skip this film and wait for a chance to see it done as a play as the movie does not do the story justice. 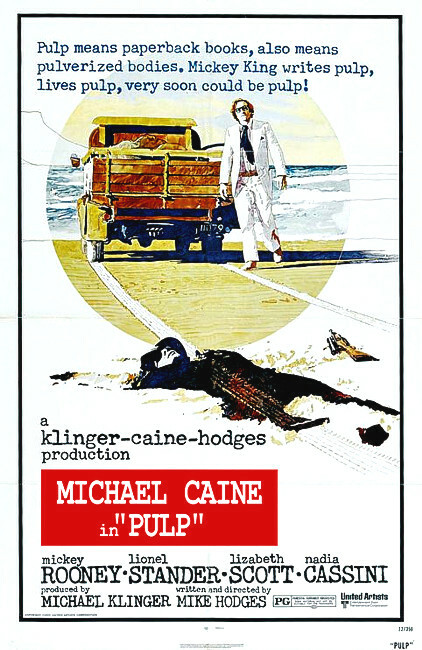 Michael Caine and director Mike Hodges teamed up again one year after doing the gritty classic Get Carter with this breezy oddity dealing with a pulp fiction writer Mickey King (Caine) who is hired to pen the autobiography of ex-Hollywood star Preston Gilbert (Mickey Rooney) who is now living in exile in Malta. The problem is that Gilbert has ties to the underworld and Mickey soon finds himself running for his life while meeting up with a barrage of oddball characters along the way. The movie has a wonderfully quirky sense of humor with a few memorable laugh-out-loud sequences especially at the beginning. I got a real kick out of the man with a weak bladder who says a prayer to God to open up a locked bathroom door when he can’t get into it. The scene in the bus where we hear the different thoughts going on inside each of the passenger’s heads is great as well. The opening sequence featuring a row of lady typists writing up King’s latest manuscript is cute, but the one thing that holds it all together is Caine’s wry voice-over narration that remains consistently amusing. Rooney though manages to steal the whole thing with his hilarious send-up of an aging actor. In fact this may be one of the funniest roles of his entire career. Even the scene showing him shadow boxing in his underwear is engaging although thankfully the camera doesn’t stay on it for too long. I was a bit disappointed that the character didn’t last through the film’s duration, but his death scene is so funny that it almost makes up for it. It is nice to see Lizabeth Scott in her last film to date and first since 1957 when she was essentially blacklisted from Hollywood purportedly for her lesbian leanings. Although only 50 at the time her aging face looked like she was almost 70 and her deep, raspy voice sounded similar to the demon’s in The Exorcist. I thought she could’ve been given more to do and played a character that was more integral to the story as her screen time is much too brief. The on-location shooting done on the island nation of Malta is another asset. The sunny weather has a nice exotic feel and the old architecture of the buildings helps give the film a visual distinction. The melodic piano soundtrack is pleasing and I wished it had been heard a little bit more. The story is full of a lot of unexpected twists and turns that manages to be engaging for a while, but I felt it runs out of steam by the end. During the final 15 minutes I found myself a bit bored and no longer caught up in it. While I do like the scene where the gunmen gets run over by a pick-up and shown from the point-of-view of the driver I still felt that the ending lacked the finesse and quirkiness of the beginning. 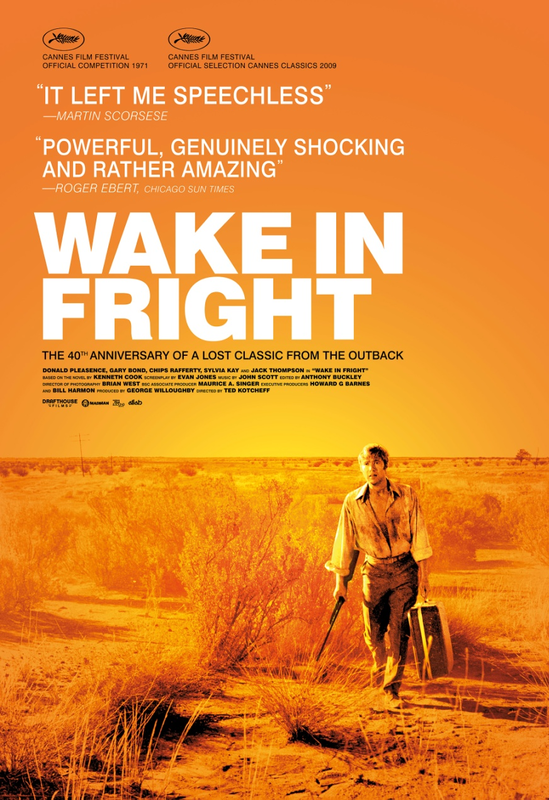 The offbeat ideas that writer/director Hodges showers into the film become dried up with a finish that lacks any payoff and unfortunately sullies what is otherwise an offbeat gem waiting to be discovered. 4-Word Review: He doesn’t like deserters. Charlie (Rod Steiger) is a hard-bitten conservative man who lost his 23-year-old son in the Vietnam War. 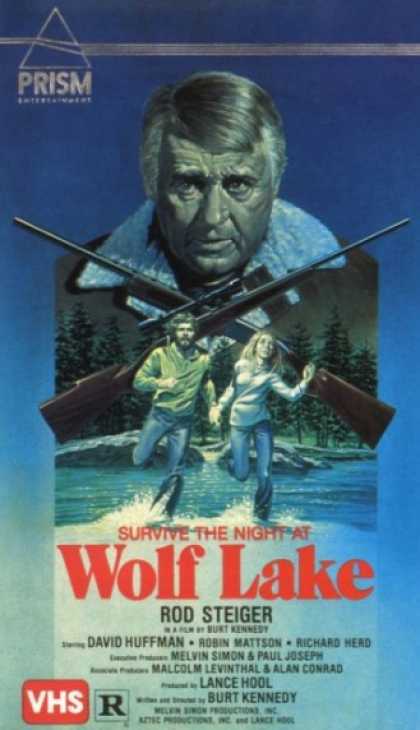 He likes to vacation with a couple of his middle-aged buddies Wilbur (Jerry Hardin) and George (Richard Herd) at a remote Canadian hunting lodge. However, this time when they arrive they find that the regular lodge owner is not there and instead it is being run by a young man named David (David Huffman) and his pretty girlfriend Linda (Robin Mattson). Charlie and David almost immediately are at odds as they both share a wide variance in age and political leanings. What is worse is the fact that David is a war deserter and once Charlie finds out about this he flies into a rage of psychotic proportions, which culminates in a violent night of terror for both David and his girlfriend. The film was written and directed by the normally reliable Burt Kennedy who is better known for doing westerns. After watching this I think he should have stayed in that genre as this film is too formulaic and one-dimensional. There seems to be too much emphasis to conform to the horror movie/slasher style formula of that era with a plot set-up that is too brief and character development that is almost non-existent. The story shows its cards too quickly and then proceeds to just plod on and on until it climaxes with a predictable and boring finish. Charlie and David’s arguments and confrontations fail to elicit any type of tension. Their shouting matches are rhetorical and redundant and their points-of-view are handled at a superficial level that allows for no new insight, or intellectual debate. Charlie is so limited in his stubbornness that he becomes annoying instead of threatening, or scary. The final 25 minutes when the two sides wage a proverbial war between their two cabins is the only time that there is any action. However, by then I was completely bored with the proceedings and so emotionally detached from the third rate material that it was a strain just getting through it. The film’s ultimate message is heavy-handed and done so much better in other films on the same subject that it renders this excursion as pointless. Steiger is wasted. The character he plays is poorly defined and doesn’t allow him to take full advantage of his acting abilities. He gets stuck with another one of his many wigs this one looking like the same type of gray haired rug that actor Ray Milland used to wear in his later years. The producers should have just allowed him to appear bald as it would have fit this type of part better and even made him look creepier and more menacing. Huffman is the best thing about this movie and it is a shame that his life and career were cut short when he was murdered in 1985 while trying to chase down a suspected purse snatcher. His performance here is nicely understated, which helps carry the picture as he is the only character that is multi-faceted. Although the story takes place in Canada and the landscape certainly looks Canadian I was surprised to learn that it was actually filmed near the city of Creel in Chihuahua, Mexico, which due to its high elevation has a climate that is more similar to the North’s. There are actually two different versions of this film. There is this one and another one entitled The Honor Guard. In that one there are no flashback scenes like there are here and in the end Charlie ends up killing David and his girlfriend while in this version Linda shoots Charlie before falling over dead herself. I actually liked the flashbacks that are used as it gives the film what little suspense it has and also shows a bit of cinematic flair. However, the scene where Linda miraculously comes up with a gun and killing Charlie before keeling over looked cheesy and clichéd and I might actually have voted for the alternate ending. 4-Word Review: Fields had a girlfriend. 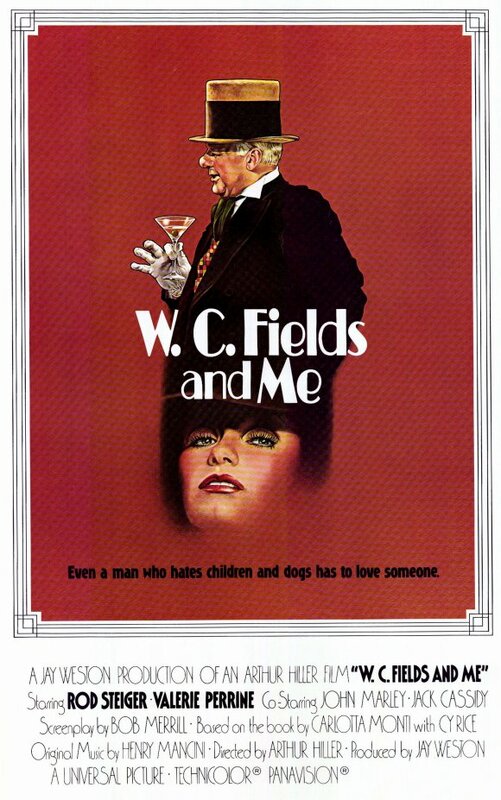 Based on the memoirs from Carlotta Monti who was W.C. Field’s (Rod Steiger) companion for 14 years this film looks at their relationship as well as W.C.’s alcoholism and difficult personality. This biography is highly romanticized and very light on the details. Apparently only one scene from the book is actually used in the movie. If one watches this in hopes of learning more about Field’s the man they will be disappointed. The tone seems similar to Oliver Stone’s The Doors where the intent is more on perpetuating the myth of its subject instead of tearing it down and showing the complete person. Just about everyone is familiar with Field’s drinking and cantankerous behavior, so having the film dwell exclusively in this area for the entire time is not interesting, or captivating. The story would have been better served if it had been a complete bio beginning with Fields life as a child and then going all the way through to his death. Apparently he was born to an alcoholic father who beat him forcing Fields to run away from home at the age of 11 and live in a hole in the ground where he became dependent on stolen food and clothing for survival. He was in many fights and in and out of jail for most of his youth. Showing this could have been quite revealing, but instead the film skips past all of it and starts instead with Fields already in vaudeville and recreating a lot of corny comedy routines before having him drive off to Hollywood where his ascent to stardom seems much too easy and superficial. 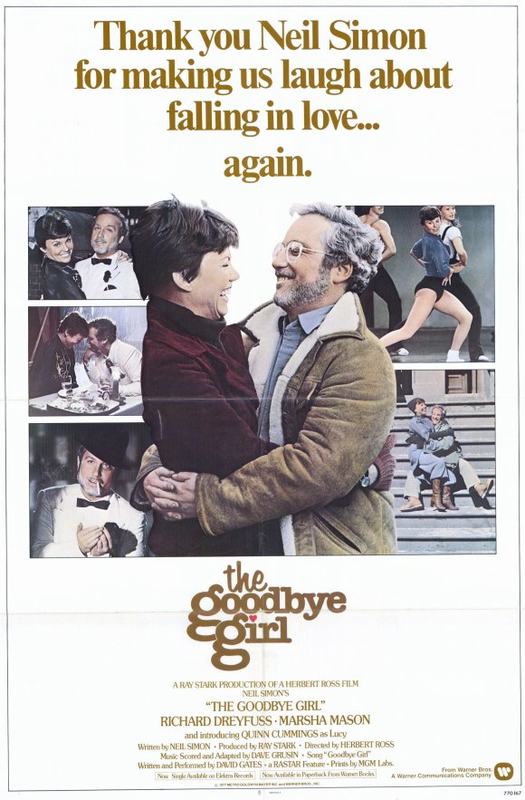 Things improve during the second act when he begins his love-hate relationship with Carlotta (Valerie Perrine). Part of the reason this works is because Perrine is excellent. Her down to earth sensibilities really help balance the flamboyant ego’s around her and fit the character well. She is the one, not Steiger, who carries the movie and it was worthy of an Oscar nomination. Steiger thought for sure that he would nab his second Oscar for his portrayal here, but instead didn’t even get nominated. His mimicking of Fields voice comes off as too rehearsed and effected. At times it gets annoying and just makes one want to watch a movie with the real Fields instead. His dialogue is too cutesy using lines borrowed from many of W.C.’s famous jokes and punch-lines. As expected he does induce the character with his famous Steigerisms and manages to not make it a complete misfire that it otherwise is. The scene, near the end, where Fields meets his now grown son that he hadn’t seen since he was three is his best moment. Jack Cassidy is great in support as actor John Barrymore. The scene where he dies and his friends prop his dead body up into a chair and have him holding a liquor glass is amusing. Dwarf actor Billy Barty is good as Ludwig one of Field’s long-time friends. Some of the scenes the two share together are actually quite touching. The film does a commendable job of recreating the period atmosphere. The music has a nice soothing quality to it and on the charm level it scores a bullseye. Despite my reluctance I found myself entertained by it, but as a biography it is flimsy, fictional and irrelevant. 4-Word Review: Blow up the Queen. 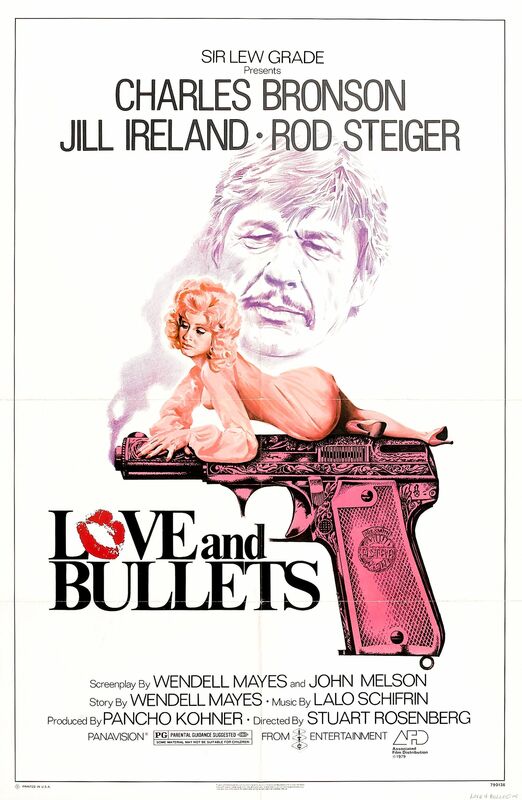 This review will be the first in a month long series analyzing movies from the 70’s that starred Rod Steiger. Steiger was an interesting performer with a long and varied career who always brought a unique intensity to all of his roles. He performed in a wide variety of movies from Hollywood pictures to foreign films and from big productions to the low budget as well as going from the leading man to character actor. Every Friday during the month of January I will select films of his that will hopefully be able to spotlight a little bit of all of these. Today’s film deals with the story of Niall Hennessy (Steiger) an Irishman with ties to the IRA. When his wife and daughter are killed during a riot in Belfast he plots revenge with a plan to blow up the House of Parliament with the Queen Elizabeth inside. The movie has a great concept, but the execution is a bit lacking. For one thing the police immediately pinpoint Hennessy as the man they are looking for as well as figuring out his plan. How they were so easily able to do this not only seemed a little farfetched, but also sapped a lot of the intrigue and tension out of the story. Having the police come to this conclusion more slowly would have plotted the suspense out longer and been more interesting. This also opened the door to a few loopholes the biggest one being that they know Hennessy wants to blow up the Parliament so one would expect that the police would have their men staking out the place and on alert to spot Hennessy if he came near the premises, but instead Hennessy is able to go on a guided tour and able to canvas the building unheeded. Another scene later on has Hennessy trapped in an upstairs apartment by the police who have surrounded the building and yet he is somehow able to escape even though it is never shown how. The scene showing his family getting killed during a bomb attack is not effective. We see the mother and daughter leave a nearby building and then the film cuts away from them and goes back to the fighting in the street only to go back to the two a few minutes later lying in the street motionless. However, there is neither blood on them nor any type of make-up effects to show injury making it look more like two people lying down with their eyes closed. Seeing them actually hit by the bomb and screaming would have been more jarring for the viewer and allowed them to get more emotionally attached to Hennessy’s plight. Also, when Steiger is shown standing over them I was expecting him to let out another one of his patented primal screams much like he famously did in The Pawnbroker, but here he doesn’t and the sequence is quite brief making me wonder why would they hire an actor known for his onscreen intensity and emotionalism if they aren’t going to allow him to do what he does best especially when the scene calls for it. Steiger for the most part does well with the part although he is surprisingly restrained during most of it. It is a bit of unusual casting given that he wasn’t Irish or a native of the region however, the accent he uses is alright and I kind of got a kick out of the way he runs especially at the end. His biggest obstacle though was his wig. Rod became bald as he aged and instead of just appearing that way in his roles, which he finally did during his later years, he instead wore a variety of wigs for his parts. Some of them were okay and some weren’t and the one used here definitely wasn’t. Richard Johnson is quite good playing the relentless Inspector Hollis and I liked seeing him with a moustache. The talented Lee Remick appears as Kate Brooke a lady friend to Hennessy who allows him to hide out at her home and although she has a few good lines she is ultimately wasted. Legendary Trevor Howard is wasted as well and only seen briefly as a police commander. The best part about the movie and the one thing that gives it distinction is the ending when Hennessy goes into the parliament building with a bomb strapped to his body. Actual footage of the Queen is shown and it looks so authentic that many people thought she had been involved in the production, but she really wasn’t. Their ability to crop this footage in with the action is well done and almost seamless and certainly helps to heighten the tension. Seeing a young Prince Charles looking bored with the proceedings and the elaborately decorated interior of the building as well as its many large and majestic hallways and rooms is fun and interesting.